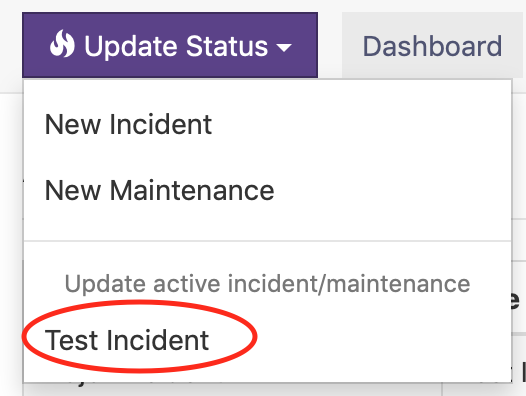 Wherever you are in your status page's admin panel you'll always have a handy purple button "Update Status" at the top left, this button will let you do two things in one step, create/update an incident and change the status reported in your status page. Create Incident: Allows you to create a new incident (major or minor). Create Maintenance: Allows you to create a new scheduled maintenance. Update active incident/maintenance: This section will display only when you already have an active incident or maintenance, and those will be listed here, when clicking on one you'll be able to publish an update on the incident/maintenance. Title: A short title that describes the incident in few words. Type: Can be Major (something that involves downtime for example) or Minor (a service becoming slow to respond for example). Starts at: At what time did the incident started? by default is set to the current time, but you might want to report an incident that started a few hours ago. Ends at: You can leave this field blank is the incident is currently ongoing, but if you are reporting an incident that happened in the past you can already register when it finished. 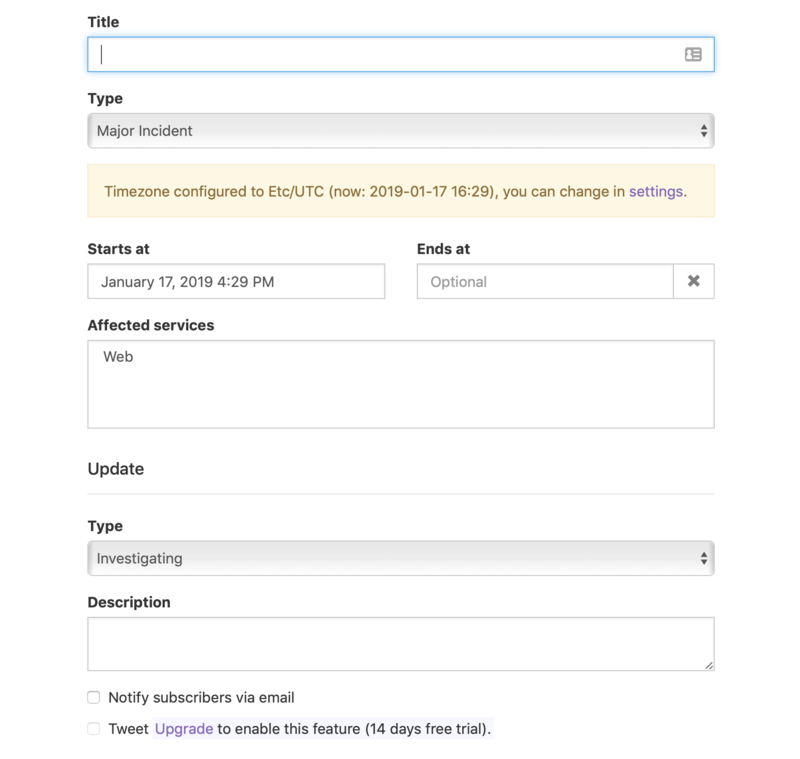 Affected services: Select the services that are/were affected by the incident, you can select more than one by holding control/command and clicking in multiple. Update type: The update type communicates how are you currently handling the incident, you might be already investigating it, or monitoring it, it might be reported in retroactive otherwise you can simply choose Issue. Description: Communicate in detail what is the incident about and what are you doing about it at the moment. Notify subscribers via email: When checked we'll send an email to your subscribers with the details of this incident with a link to it in your status page. Tweet: When checked you'll first be prompted to configure a Twitter account (one time) and then we'll tweet the details of the incident with a link to it. Creating a scheduled maintenance is pretty much the same, the main difference is that you'll probably want to enter the End date as part of your maintenance creation so that you communicate to your customers a clear schedule for the maintenance that they can keep in mind. So you finally have that incident under control, and you want to communicate this to your customers ASAP, this should take no time with Statuspal. 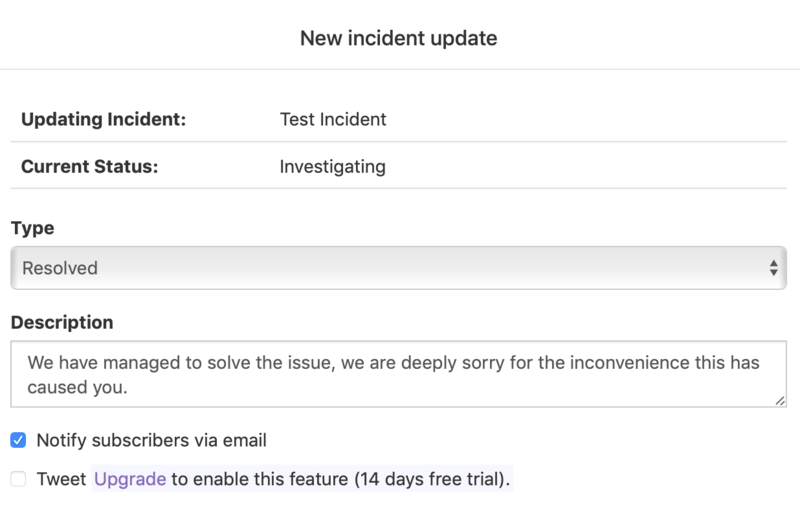 Then you'll be able to enter an update on the incident, you'll want to select Resolved from the type field and enter a descriptive message like "We have managed to solve the issue...". Click on Update and the incident should be marked as resolved and your status page should report no ongoing incidents (if this was the only one).